Mimbre was invited by Maria Grazia Chiuri, Creative Director of the Dior women’s collections, to participate in the spring-summer 2019 haute couture show at Paris Fashion Week. 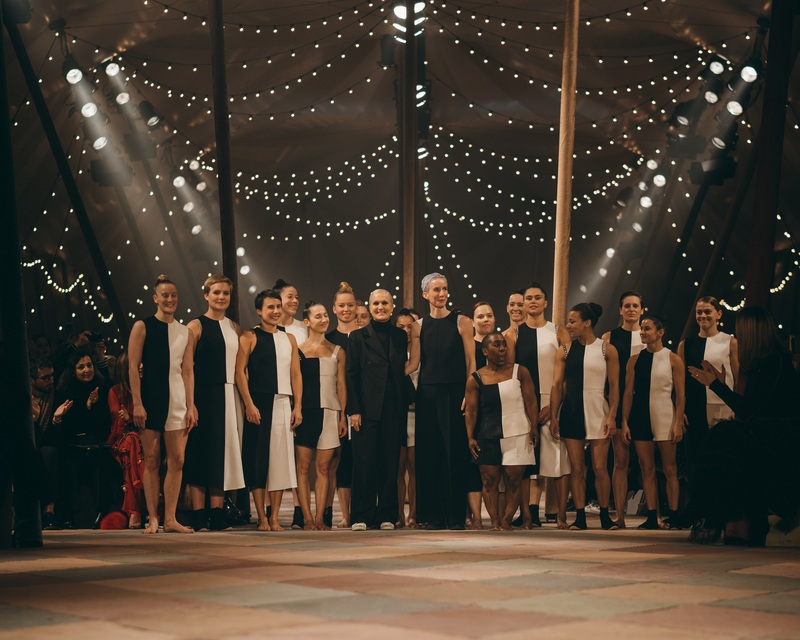 18 female acrobats took to the runway for the specially commissioned and choreographed performance for Christian Dior’s Spring Summer 2019 (SS19) show at the Musée Rodin. Maria Grazia Chiuri wished to give form to the inspirations that shaped the creation of this haute couture collection, with a performance by Mimbre developed specially for the occasion. A series of human pyramids and powerful monochromatic shapes highlight the imagination that inhabits the pieces in a collection celebrating the circus and its links with costume, fashion and art. The traditional circus tent setting was designed by Shona Heath and Bureau Betak. The performance took inspiration from the female circus performers of the past, as well as the environment of the Musée Rodin where it was presented, using the sculptor’s work to inform the acrobatic performance. Alice Noel, Alison Halsted, Anesta Mathurin, Arielle Lauzon, Clemence Gilbert, Elinor Harvey (understudy), Emily Nicholl, Jessica Niven, Joana Dias, Kaisha Dessalines-Wright, Karin Melin, Laura Overton, Lisa Whitmore, Marianna Boldini, Mimosa Percy, Rebecka Nord, Rosy Roberts, Sally Miller, Silvia Fratelli.